Champion Door manufactures large vertical-lifting fabric fold-up doors for shipyards and industrial applications, multi-part fold-up doors for aircraft hangars, and doors for crane openings. Champion Door fabric fold-up doors are suitable for shipyards and ports doors as they withstand sea climates and high wind loads. The doors are designed to resist challenging corrosive conditions and winds according to current EU standards, and made using polyvinyl chloride (PVC) material that is resistant to welding sparks. Champion Door offers NK4 Warm, the market’s only specially insulated fabric fold-up door model. The lightweight Champion Doors do not require heavy support structures. In addition, due to their innovative lift mechanism, the doors do not need tracks on the floor or large frames. These features significantly reduce hangar construction costs. Champion Door makes sure that its high-quality products guarantee reliable usage with low maintenance costs and easy and smooth operations. The doors can be manufactured in any size, and are available in all wind classes. They are tailor-made according to customer needs and can be delivered and installed as a turnkey project. Close co-operation between the designers and builders guarantees successful door projects and customer satisfaction. Champion Door offers a comprehensive service concept to facilitate the design and maintenance of each door manufactured. The company offer full support services starting from the design phase. Clients can download ready-made building information modelling (BIM) objects to support architectural design, while Champion Door also carries out strength calculations and creates customised plans based on specific projects. The company ensures the performance of its products by signing a maintenance contract with the customer and making regular service visits. As part of the contract, it offers its unique Secure Remote Connection (SRC) service, which allows clients to programme door functions remotely via a secure internet connection at any distance. With the SRC service, clients also receive access to comprehensive information on the door’s usage history. 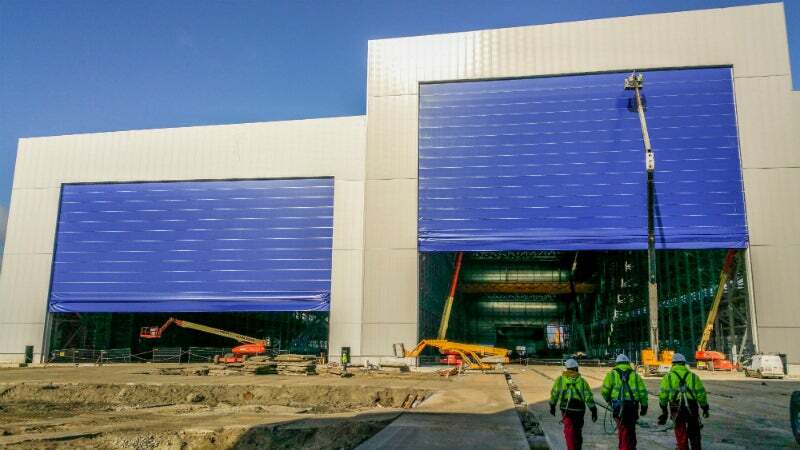 Champion Door has delivered and installed one of the world’s largest shipyard doors to Neptun Werft, a part of Meyer Werft Papenburg, in Rostock, Germany. Champion Door delivered a gigantic folding door to the Meyer Werft shipyard in Papenburg, Germany in October 2016.